Dr Afsana has been working for BRAC, for over 21 years. Currently, she is the director of health, nutrition and population. She is a professor in James P Grant School of Public Health, BRAC University, Bangladesh. Dr Afsana is an MD with an MPH from Harvard University, USA and a PhD from Edith Cowan University, Australia. She has been awarded many prestigious awards including the Woman of Distinction Award 2011 by the NGO Committee of the Women Status, New York for her contribution to maternal health and women’s empowerment; Presidents’ Prize for the best thesis on an Asian topic by Asian Studies Association of Australia; D.K. Agencies India’s award for the best Australian doctoral thesis on an Asian subject; the 2003 University Research Medal and the Faculty Research Medal for the best PhD thesis from Edith Cowan University. Dr Afsana authored two books, Disciplining Birth: Power, Knowledge and Childbirth Practices in Bangladesh and Discoursing Birthing Care: Experiences from BRAC, Bangladesh and published articles in peer-reviewed journals and books. Dr Afsana is the section editor of the Journal of Health, Population and Nutrition. 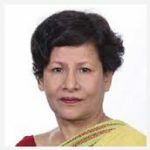 She represents BRAC at national and global levels and plays a special role in policy-making, planning and technical guidance, particularly, in reproductive, maternal, neonatal, child and adolescent health and nutrition.